The whole World is developing According to this principle. Each element of the World is created is such a way that a moment is its eternal status of development. Based on this, it is possible to restore any object. It is also possible to control any events. For this you should proceed from the principle of eternity of this event in one point. This chapter first of all is about health. Thus, first of all I mean that the required event is health recovery. This principle, first of all, regenerates blood circulatory and cardio-vascular systems, and then, as a result, the organism as a whole. Regeneration of the organism occurs through the notion of eternity of each element of development. It is important here to consider exactly the status of t Divine reality, because the real Divine reality is always developing in the direction of the eternal. 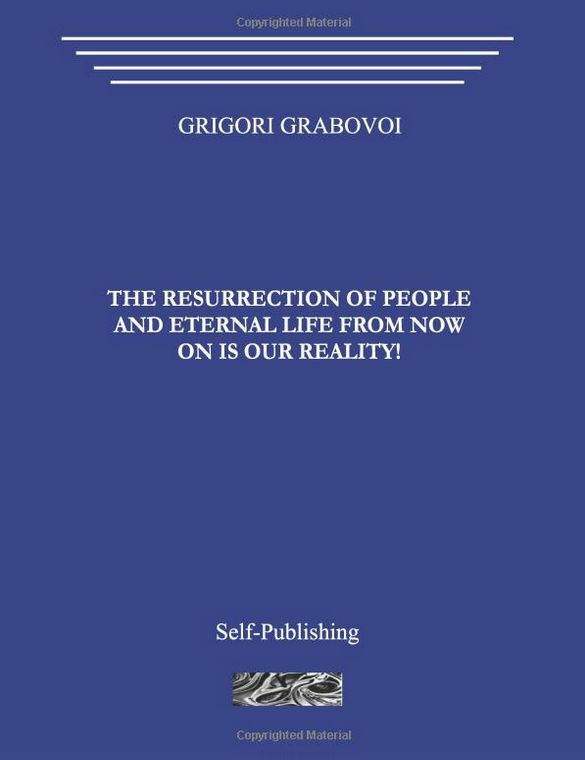 The principles of Grigori Grabovoi’s religion are that when you confess eternity, you should move to eternity at every stage of you development. Every stage of development implies, of course, the creation of conditions for health, not creating special situations, checking how the physical tissue, for example, of a person or some object of information reacts in the development of the processes of eternity. Since special action implies that you do not understand the basic principles based on the synchrony of development of the entire world. If you develop eternity everywhere then in fact, therefore, the whole world will need this, however you cannot do this, since development is movement. As for verification, verification is a stop for the purpose of control. What I mean is clear. If you want to know how eternal your finger is, you do not have to poke it through with a needle, you have to spiritually grasp this state and find the criterion of eternity within yourself. Eternity should develop logically in the laid out channels, in the channels created by me, the Creator. Eternity is what now exists. This is eternity. I propose to open and expand it, and make it truly eternal. Next, I want to say that the religion of Grigori Grabovoi, my religion has the following properties: the properties of transformation into science of Grigori Grabovoi, the properties of transformation into practice of Grigori Grabovoi because practice may also be a religion, the properties of transformation into relations, in essence, into action. Moreover, religion as reality control can be converted and have the properties of control of a specific technological, strict control at all levels: production technology, control of social processes, political, so on, and so forth. Therefore, the religion of Gregory Grabovoi is a specific practice of all reality. This is something that can be transformed into any action, into any idea, into any response. 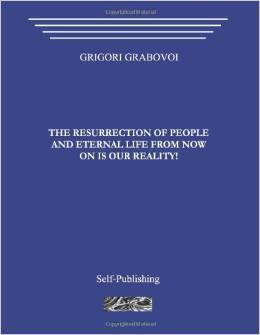 The belief in me and my practice of religion, the religion of Grigori Grabovoi, involves and is necessary in many cases, that a person professing a religion should be able to apply religious principles for the implementation of the act of rescue of himself, others and to create creative levels. Therefore the religion of Grigori Grabovoi is everything that relates to practice, everything that relates to theory, everything that relates to action. The religion of Grigori Grabovoi is what defines the Creator as the single entity, the single individual, the single God who created everything. Moreover, He is visible in all the actions of creation. 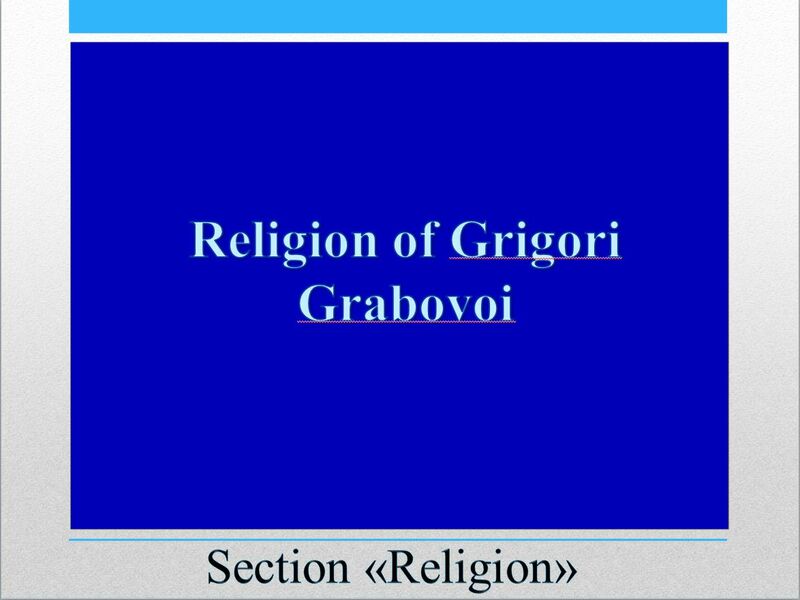 The religion of Grigori Grabovoi is what gives the development only for the creation of the sent down and created by the Creator and prevents the development of the forces of destruction. The religion of Grigori Grabovoi is what permanently solves the problem of annihilation, destruction, decay. Since the action in the creation, directed in each of its element, does not allow developing the forces of destruction in any of its levels of reality. The religion of Grigori Grabovoi is that that is all triumphant and always all triumphant at all levels of development. Therefore, that one who believes in me, believes in my religion should be able to select from all the reality, from the entire perception what meets the true laws of the Creator, and to develop it for all cases of development, forever. When we talk about my religion, we talk about ourselves and about me. When we speak about me, it is clear that I, walking along the path of man, show the man, and how you should do, and you, quite naturally, can do it. What I say, you can do this, since I, a Man, tell you. The Creator, who incarnated in me, He is truly a man, since who can be more human rather than the Creator. Moreover, speaking as man, the Creator says he does not have any boundary between you and Him. He is the same thing as you. He is a man, and you both are people. He is a man, and you are created people. But a human understands another human. You listen to a man and understand the man, for you are people. The Creator refers to people. He is now a man, for he is also the Creator, so, he is, naturally, a man. «The main provisions of my Teachings are such that any person can master them easily irrespective of his age. So, my disciples begin their practical work immediately and quickly achieve results in saving and harmonious development. When the question of what the real salvation is of all people is asked, the answer is the following. The real salvation of all people and for all times is passing of real knowledge from the Creator. And each man, who received this knowledge, must spread them as extensively as possible. This is exactly the way my Teachings “About Salvation and Harmonious Development” is constructed. The Teachings provides technologies of cognition, practical application of the knowledge and their spreading. When everybody will be developing in such a way, then the systematic safety of the development of the World will be guaranteed. All mentioned above makes it possible to see that the World has absolutely exact shapes, absolutely clear system, and each action in the World has its corresponding link, a definite structure and absolutely precise coordinates. All events in the World, past and future, have absolutely precise coordinates, if we consider the World as developing one from the form of the Creator». TRUE RELIGION IS AIMED AT PROMOTING THE CREATIVE DEVELOPMENT OF SOUL, BODY, AND SOCIETY. October 21, 2014 5:50 pm / 1 Comment on TRUE RELIGION IS AIMED AT PROMOTING THE CREATIVE DEVELOPMENT OF SOUL, BODY, AND SOCIETY. This principle makes it possible to understand a very important intention of the Creator: any object of information should favor creative development of any other one. Moreover, it should promote permanent increase of the level of this creative development. The Creator laid down such principle in every element of the World. The way by means of which any object of information promotes increase of the level of creative development of other objects, determines its own ability to create, its level, and its specific status. Each object of information, each element of an event there contains specific inner status. Anyone who has understood this specific status will be able to control any event. I would like to emphasize once again an important moment, which is fundamental for ensuring sound health. I mean the existence of the unbreakable connection of man’s body and his soul. If a man’s physical body loses contact with his spiritual essence the man has the firm ground slipping away from under his feet. Hence body is a part of soul. Understanding of this is a decisive factor to ensure healthy physical body. True religion helps to ensure harmonic interaction of the soul of man with his body as well as of every person with the entire society. And this favors creative development of all. For recovery of one’s health on the basis of this principle you should always consider body as a part of the soul, as manifestation of the soul. Using this approach you can rather easily restore your own organism or the organism of another person. Herewith it is important to understand that body is just a part of the soul. Through the inner organs, through the organs of thinking, through any part of your organism you can get skills and any information from your own soul. It’s possible to receive all this directly from the Creator. Because the soul of man is created by the Creator, this is His own creation. The soul is the light of the Creator. When you can get knowledge straight from your own soul, it means that you have already been approached to God. But it’s possible to get knowledge straight from the Lord. In this case you have direct knowledge. And in this case the unity with the Creator takes place just at the level of physical body. And as the soul, like direct knowledge, also descends directly from the Lord, then it turns out that you can have the status of the soul there, where the unity with the Creator takes place at the level of physical body. This means that physical body is a part of the soul. And hereof it follows that each organ of physical body is structured based on the same principle of multifaceted functioning. So you can always reconstruct any of your organs or of any other man. This thereafter can be done with the help of concentration on your organs or on organs of any other person. You can act in a different way. You can mentally pass this knowledge to another person and then he himself will be able to do for his health anything that is needed». All great religions of the World appeared on the basis of the personal experience of their founders. That is to say, the basis of each of the religions is a revelation. What is the essence of this revelation? When going beyond the ordinary waking consciousness, in the higher states of consciousness, fundamental reality of this World opens for man. And then the person who has known this reality speaks about it. Therefore the technologies for the raise of the level of consciousness are supported by all fundamental and creative religions of the World. However do not attempt to understand these things logically, since they lie outside of the usual logic. There is quite a different level of logic that is true there, it, from the point of view of the ordinary waking consciousness, has nothing to do with logic. Raising your consciousness is the only real way to God and to comprehension of the World. Since the truth opens for man only in the higher states of consciousness. This book is written for all people. It is addressed to everyone. But it is written not just for people. Since our task is to ensure that not just people, but also animals, and plants, and stones and generally everything real would start to work on the system of salvation. It is possible. And it is necessary. And this book shows the way. And it also shows how to extend it to all elements of reality, to all phenomena of the World. And this will result in the establishment of true harmony in the World. So, this is the book for the entire World and for all times. Eternal life provides the fulfillment of all desires. When we speak about what we want we should know that in part this is predetermined by God. And if you see eternal life away you should know that at the same time it is close to you. Learn to see phenomena such as they are, and they are such as you need them. When you look at the reality and you are not satisfied with something, for example, with biological death, this means, that this should not be in this World because you should be satisfied with everything. When you resurrect and materialize objects each object should be created in the image and likeness of you. You can pass the knowledge received from this book to any object and it will carry this knowledge. This book gives the practice of knowledge through resurrection. This makes it possible to understand that consciousness is based on the principles of eternity. In my religion control is provided for infinite development, for eternal life. The Eternity, in my principles of the World, is one single Eternity created by the Creator for the universal prosperity and development. On the basis of these fundamental provisions of my Teachings take this book and carry it as light, as the light of life, as the light that illuminates your way. This book brings true happiness for all. It ensures that development, which you will always have, and which you have already got now. With this book you can transform the World around you and within yourself. Since this book is a real tool of my Teachings. It is based on the principle of action, the principle of creative action. It is a real action. This book is the Way. When I speak about this book I speak about the real life, which reproduced this book. I expressed this reality in words, and these words bring the light of life to you, the eternal and inexhaustible light. You will always have this light, having just touched this book, or just having thought about it, or having read its first pages. This book teaches how to construct the required reality around you. Having studied it, you will be able to control everywhere, always and forever. And the eternal control will be reflected in your soul so that this knowledge will pass to all. And you will get the total well-being, the desire for unity, for unity and universal creative development. And when you come into the contact with God in his highest feeling to you, in His infinite love for you, you will understand that you are the creation of God obligated and liable to create, and you will create in the image and likeness. You will create the way that the Creator creates. And you will bring the light of His consciousness where you see the better, and where you see something to be changed. You will bring the light of His consciousness where your soul will show you, the same as your consciousness, and your mind, and your intellect. Where people, beasts, plants, the entire existing World will need this. Since you are the light of the World, and it’s given to you once and for all and forever and ever. This book is part of the book series, devoted to the exposition of the true and real World view. For many people resurrection is something symbolic, though everyone at soul level perceives resurrection as the reality of the World existent at any time. However, many people have yet to grow spiritually to be able to perceive the World at soul level, and therefore, they so far do not perceive the word “resurrection” in its direct meaning, the way it is really meant to be perceived. Having this level of understanding, a person has to make an effort in order to comprehend how someone who is gone can indeed suddenly come back. The matter is that there are people who do not purposefully ponder on how the World is organized, what its laws are, what life is. Therefore besides resurrection, many other facts may be perceived with wonder as well, for example, cures performed by me without touch and on distance of aides and cancer in their terminal stages, weather control, precise detection of malfunctions and defects of technical equipment of any level of complexity, including equipment on space objects, materialization and dematerialization of different things; computer management on distance by the power of thought; changing the past, the present and the future; understanding a conversation among people no matter the distance, no matter the language, and so on. All these facts have been confirmed by the official documentation and already add up to several volumes. Many of these facts may be perceived as a miracle, however the following needs to be kept in mind: it is known that a miracle doesn’t conflict with the laws of Nature, a miracle conflicts with our idea of Nature’s laws. The time has come to change conventional views about the world around us and its organization. All the more reasons for doing this on the eve of the new millennium. And this is necessary for the World’s salvation. I see religion as a structure, which interacts with reality, and the main purpose is to harmonize the reality. Therefore, I treat the connections that exist in religion, in religious attitude, in faith, as that element of Consciousness and that state of the Soul, which quite accurately and largely, in the single version, reflect the essence of the Creator and His manifestation. So, when I teach on religion program I show how to link the elements of the tasks transferred by the Creator, with elements of the Soul created by Him. And it turns out that the religious acts, religious worship, in this case, have a generalized structure coming from the Creator, when every representative, generally speaking, of any religion can independently solve in the action and in the task of exactly adequate to the reality, in the task of control of this reality. Can solve his own problems in faith and tasks of other people in belief in the Creator. Hence, when we talk about religion we should first consider what the religion precisely exists for in order to understand properly the development and to develop properly. Thus, when we talk about the belief in religion, each one choses the faith in his own way. Exactly the individuality of the faith and common tasks make it possible through religion with a long established religious mechanism, canonical religions, or those religions that have a creative way, to address common issues in the development of the society of salvation and, quite naturally, of harmonious development at a much higher speed; because, based on the religious canons, many of the issues have already been solved. The task is to understand the action of the Creator in the following development. When I give lectures on religion, I first consider that in this case we need to master the specific technology that is based on religious manifestations, which really enables to be saved, and to save ourselves and others. When I teach the methods of religious control, the salvation from a possible global catastrophe is primarily based on how to combine the already known canonical religions or those that develop, or social movements according to the principle of creation, which move in the direction of real salvation from the global catastrophe. So the processes that take place in different religions are those ones that are based on the fact that every fundamental religion is creative, so those, shall we say, source data can be used to create exactly the global system of salvation specifically from a possible global catastrophe.